Asus' UX range is aimed at the high end of the laptop market, and targets rivals such as Sony's VAIO range. The UX50V is a compact and stylish 15.6-inch machine, offering impressive quality and a distinctive design. It features a surprisingly thin, clamshell design, minimal ports to ruin the lines, and a very glossy design. The palm rest features a mirrored ﬁnish, looking more like glass than plastic, and this is generally the most reﬂective laptop we've seen so far. It looks great straight out of the box, but is quickly covered in ﬁngerprints. Quality is a cut above average, with smart textured plastics in the areas that aren't mirrored, a neat cylindrical hinge that holds the panel ﬁrmly in place, and plenty of protection for the LED display. The screen features a high-gloss plastic coating, stretching from edge to edge, creating a frameless appearance. It looks good, but once again puts form ahead of function, with a reﬂective outcome that can frustrate. Colour reproduction is good though, with bright images on offer. An Nvidia GeForce G105M GPU has been shoehorned into the skinny chassis, offering moderate 3D performance. It's no gaming machine, although many older games will run without trouble, and you'll have no problem running ofﬁce tasks, movies or browsing the web. It's also possible to switch to an integrated Intel GPU when battery life is a primary focus. 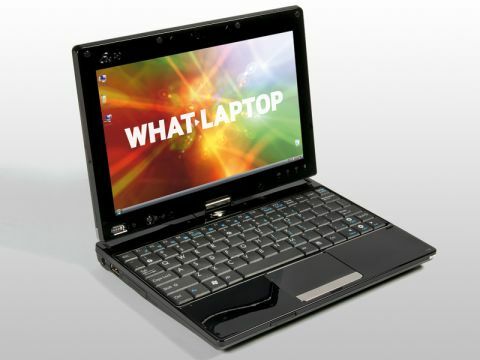 Ofﬁce performance is likely to be limited, with an Intel 1.4GHz Core 2 Solo processor used. 4096MB of memory is a welcome inclusion, although the fact we had a pre-production sample meant we were unable to carry out benchmarking or battery tests. Many users will lament this choice of processor, but we found it to be reasonably effective in daily use. The keyboard offers excellent comfort, with the same isolated key design now sported on Sony, Apple, Samsung and HP machines, making it easy to type at speed. Ambient backlighting is built in. The board on our pre-production unit ﬂexed slightly under pressure, but Asus assured us that this will change for full production models. USB ports, along with VGA and HDMI-out ports. 802.11n Wi-Fi, Gigabit Ethernet and Bluetooth are all provided as standard. The Asus UX50V offers a lot of style and quality for the money. It's also a comfortable choice with decent 3D power on offer. Whether it's stunted by the single-core processor remains to be seen, but it's still an impressive start.